Experience the essential indulgence of nurturing professional spa services. Our menu of services offers the finest spa treatments. Come enjoy a luxurious spa with an unmatched level of customer service from Sydney’s staffs. 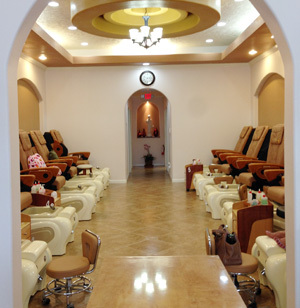 Located conveniently in Cypress, TX 77433, we offer a wide variety of services from nail service to Spa manicure and pedicure and waxing service. At Sydney Nails, our number one goal is customer satisfaction. “Our customers will walk out with happiness” is our motto enforcement. If you are not satisfied with your services, please let the front desk know, and we would like to make essential arrangement for you. Sydney Nails is truly delicate to our customers. Our desire is to ensure your satisfaction through an attentive staff, extreme sanitation and quality products. Let Sydney Nails be your sanctuary of serenity. We are looking forward to serving you! Ask for special occasion Packages (group of 5 and more). Gift Certificates are available as well. We offer complimentary water, sodas, Red wine, White wine and Margarita for all of our clients.